Over breakfast we decided to spend New Year’s Day at the seaside. Many friends have asked me if we live near the sea. Since Istria is a peninsula, it naturally has lots of seaside. And since we live right in the centre, if we want to go to the sea, we’re spoiled for choice. If we head east, west or south, we’re bound to hit the coast, which is only about 20 kilometres away at its closest point to us. So today we decided to head east towards Opatija. We could have taken the highway and the Učka tunnel to get there, but we decided to take the coastal road and we’re glad we did because the views of the Učka mountain range and island of Cres were breathtaking. The weather was perfect for walking: relatively mild at 10 degrees, and no wind. 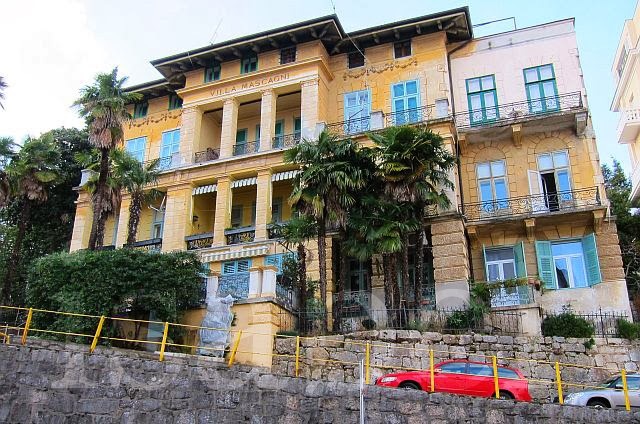 We parked in the neighbouring coastal town of Ičići and strolled along the scenic seaside promenade to Opatija. 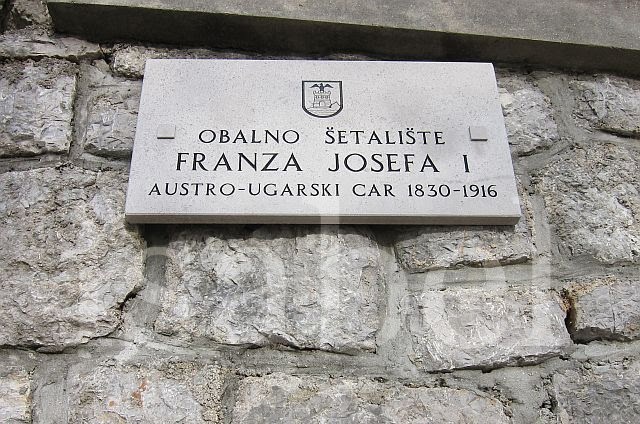 Its official name is the ‘Franz Joseph I Promenade’ (after the Austrian emperor) but locals use its Italian appellation, the ‘Lungomare’. 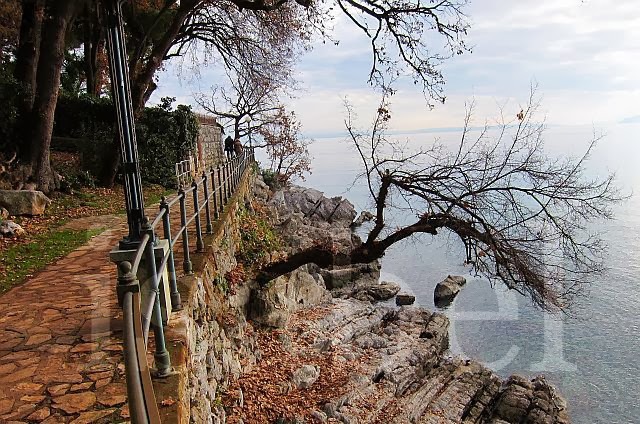 This 12-kilometre long seaside promenade was built over 100 years ago when Opatija was a fashionable tourist destination during the days of the Austro-Hungarian Empire. It still seems to be popular with the Austrians; I heard many people speaking German with the distinctive Austrian accent today. And lots of Italian too. 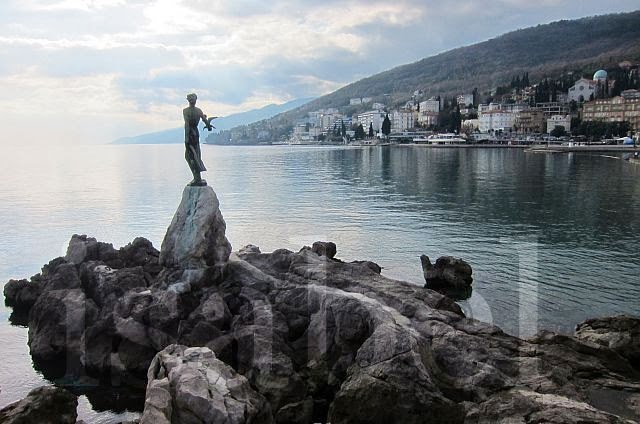 As we approached Opatija, enjoying the fresh sea air and the views of the Bay of Kvarner on the way, we could hear singing... there was a traditional Klapa concert underway on the seafront in front of the well-known ‘Maiden with the Seagull’ statue. Enchanted by the strong male bass and baritone voices and the sounds of the mandolin, accordion, double bass and classical guitar, we stopped to listen to this group of five male musicians. Many of the songs they sang were popular Croatian favourites and we liked the music so much that we approached them afterwards to ask if they had a CD. They did and we bought one! 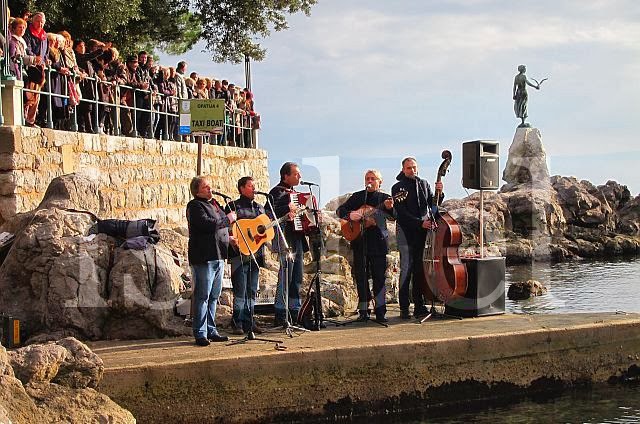 The group is called Klapa Nevera – to hear some traditional Croatian Klapa music, check out their YouTube page here. During the concert, a group of men wearing Santa hats jumped in the water! This was not part of the show, but a few locals taking part in this New Year’s Day tradition of taking a ‘cold swim’. 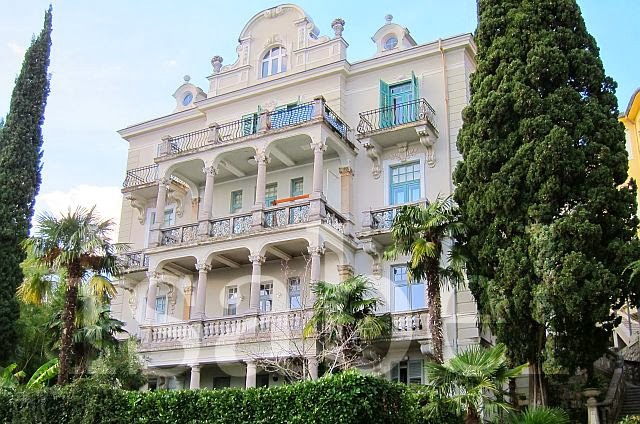 After lunch we walked back to the car, admiring the many beautiful historic Austro-Hungarian and Italian-style villas. 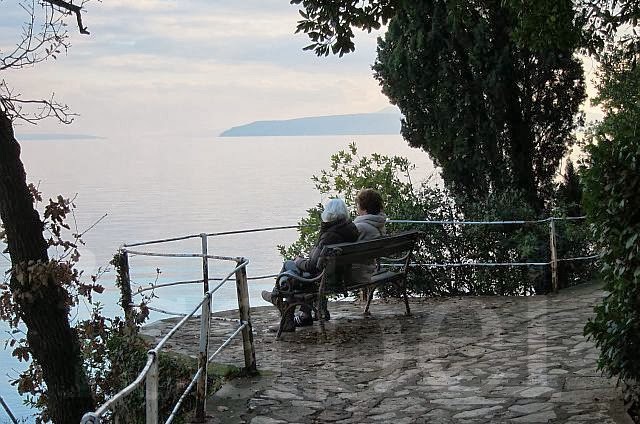 A trip to Opatija, the music of Klapa Nevera, and a long walk along the Lungomare was a pleasant way to spend the first day of 2014. Thanks for sharing this Isabel. It sounds absolutely beautiful. Happy New Year! Thanks Susan! Happy New Year to you and your family. Sretna Nova Godina!! Sounds like a brilliant time. Your photos are always so lovely too!